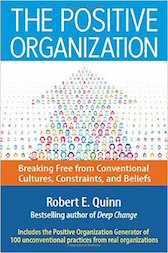 Robert E. Quinn’s life mission is to inspire positive change. He does this as a faculty member, author, consultant and speaker. 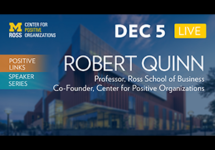 He is a professor emeritus at the University of Michigan’s Ross School of Business and one of the co-founders of the Center for Positive Organizations. As an author he has published 18 books. His best-selling volume, Deep Change has been used across the world. His book, The Best Teacher in You won the Ben Franklin Award designating it the best book in education for 2015. The Harvard Business Review has selected his paper, “Moments of Greatness: Entering the Fundamental State of Leadership,” as one of their 10 Must Reads on Managing Yourself. 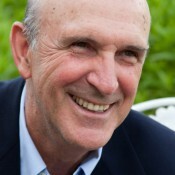 As a consultant he has 35 years of experience and is best known for the competing values framework, a tool that has been used by tens of thousands of managers. As a speaker he is recognized for drawing on research, opening minds to possibility, and arousing the desire to grow. He is a fellow of the Academy of Management and the World Business Academy.